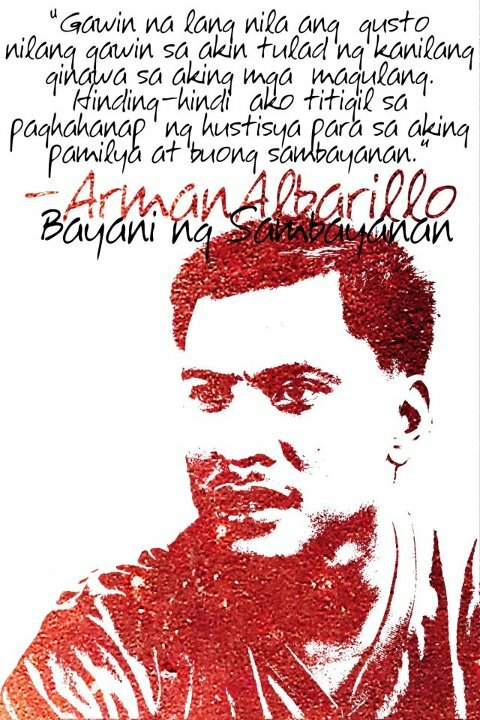 The Bagong Alyansang Makabayan (Bayan) renders its most militant salute to Arman Albarillo, former secretary general of Bayan Southern Tagalog who died a Red fighter of the New People’s Army last June 30, 20012 in the province of Quezon. Bayan takes pride in having known and worked with Arman during the difficult years of the fascist Macapagal-Arroyo regime. The Filipino people are forever grateful for the sacrifices and contributions made by Arman for the cause of national and social liberation. He died an outstanding revolutionary worthy of emulation by future generations. Arman was not an overnight New People’s Army (NPA) leader and revolutionary. He was gradually led to the path of armed struggle, ironically, by the counter –insurgency program Oplan Bantay Laya itself. He was the son of Expedito Albarillo, a Bayan Muna (BM) municipal coordinator and a barangay councillor in San Teodoro, Oriental Mindoro and Manuela Albarillo, a Gabriela member. On April 8, 2002, Arman’s parents were killed by suspected elements of the 204th brigade of the Armed Forces of the Philippines (AFP) under then Col. Jovito Palparan Jr. Before this, Expedito was placed under the military’s order of battle in 1998, was jailed from 2000 to November 2001 based on a trumped-up charge of murder. They were among the first victims of extrajudicial killings under the OBL and the notorious “Butcher” Palparan. The OBL eventually resulted in the deaths of hundreds of unarmed activists and civilians. After the brutal murder of his parents, Arman and his family were under constant harassment by the military. This forced Arman, his seven younger siblings and their relatives to become internal refugees who had to flee San Teodoro. He became a coordinator of Bayan Muna in 2004 and spokesperson and eventually secretary general of Bayan-ST in 2006. At the height of the movement to oust Arroyo, Arman led marches, caravans and Lakbayans from Southern Tagalog to Metro Manila. He was a frequent fixture of street protests and was well known by the regional and national media. In 2007, he was a delegate to the Third International Assembly of the International League of Peoples Struggle (ILPS). In 2008, he was one of the signatories in the last impeachment complaint filed in Congress against Gloria Arroyo. Throughout this period of state repression, Arman kept a positive disposition. His smile would be present even under difficult circumstances. He was known to be a fiery speaker on stage, but soft-spoken in person. Fierce and determined in the face of adversity, but remained good-natured and funny. State repression continued to target Arman even when he was already a prominent Bayan leader. In 2008, it was discovered that like his father before him, he was listed in the military’s order of battle in Southern Tagalog, a virtual hit list under the OBL. In October 2008, Arman along with 71 other mass leaders and activists in the region faced arrest following the filing of trumped-up charges of murder and multiple murder in a local court in Mindoro. The move was orchestrated by Arroyo’s Inter-Agency Legal Action Group (IALAG). This forced Arman and others to work underground, even as he continued to pursue his defense through the legal system and gather popular support here and abroad against repression by the regime. Unable to find justice in the ruling system, Arman would eventually continue his struggle as a member of the New People’s Army. We have not seen Arman in a long time, and this sad news of his death will be a bitter reunion as we pay tribute to a courageous and dedicated Bayan leader. It pains us to know that Arman died without seeing justice for his slain parents, without seeing the “butcher” Palparan finally made accountable. This in itself is an indictment of the rotten judicial system in our country. With the death of a revolutionary, the reactionaries and ruling classes will always proclaim the end of the revolution. They will gloat over the supposed setbacks and defeats of the people. They fail to grasp the laws of motion of history and society. They fail to understand that so long as class oppression and exploitation remains, so long as injustice remains , and so long as the country is not truly free; many more will follow the path taken by Arman and others before him. The reactionaries are mistaken. Their hubris and empty rhetoric will not serve them any better than the bombs and bullets they use to suppress resistance. This is what all previous regimes and the current US-Aquino regime fail to comprehend. None of them have ever been interested in addressing the root causes of armed conflict. They are only interested in escalating the suppression of the revolutionary movement and people, creating the basis for the emergence of even more revolutionaries. Indeed, the reactionaries do not grasp the laws of motion of society and the lessons of history. Arman will be missed but his memory, like the many martyrs before him, will be forever etched in the long and rich history of the militant and revolutionary struggle of the Filipino people. Arman’s life and struggle will continue to inspire our people to carry on the fight against the oppressors. We honor Arman’s memory by resolutely advancing the struggle for national and social liberation. Long live the memory of Ka Arman Arbarillo! Long live the struggle for national democracy!